3. JUST GOT CALL FROM WB9FLW, PETE EATON IN ST. LOUIS. HE HAS BUILT A TNC BOARD AND IS STIRRING UP ACTION. HE WANTS A REPEATER PROM SO I AM SENDING HIM ONE. HE IS EXPERIENCING SLOW SERVICE OUT OF VANCOUVER. Thanks again for the repeater code, and please pass along my congrats to the author for a job very well done. I have some great things planned for that program, and I think you will find the future impact greater than expected. The program assembled and loaded ok, and seems to work just fine. The KA6M/R repeater will shortly be replaced by this code running in K6VCO's VADCG TNC, and the KA6M unit will be in the shop for upgrades and the installation of some internetting software. The Pacific Packet Radio Society had its first "official" meeting on February 23rd. About 35 people attended. 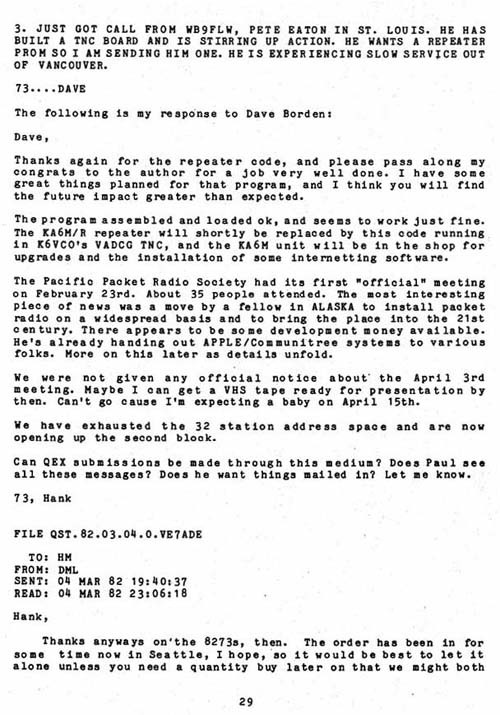 The most interesting piece of news was a move by a fellow in ALASKA to install packet radio on a widespread basis and to bring the place into the 21st century. There appears to be some development money available. He's already handing out APPLE/Communitree systems to various folks. More on this later as details unfold. We were not given any official notice about the April 3rd meeting. Maybe I can get a VHS tape ready for presentation by then. Can't go cause I'm expecting a baby on April 15th. We have exhausted the 32 station address space and are now opening up the second block. Can QEX submissions be made through this medium? Does Paul see all these messages? Does he want things mailed in? Let me know.